Philly loves Food Trucks! And what's not to love - they are normally run by creative, dedicated foodies who want to bring unique flavors to the public. And with lower over head, there's more time to talk to their customers! At a recent XPN Key Studios Session (Lenfest Plaza) I got a chance to talk to 3 great food truck owners. Later, I sent each an email asking if they wanted to participate in a new series on Tinsel & Tine profiling Food Trucks. My first response was from FARM TRUCK. 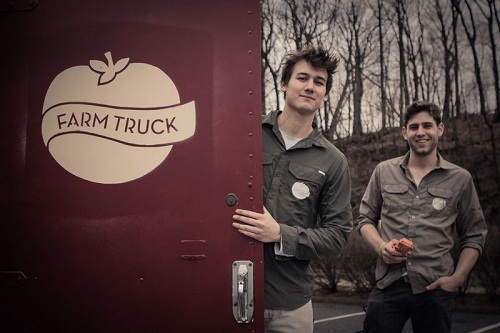 Farm Truck is run by Kris Pepper & Eliot Coven, look at these guys - if they serve 300 meals a day, then I'm sure they get at least 100 phone numbers as tips. They're so cute they should have a TV show on the CW. Yet style over substance is far from Kris and Eliot's mission, instead Farm Truck is all about being a healthy alternative in the Food Truck biz, they use local, in-season produce, buy from local bakers, serve organic coffee and go green in as many ways as possible! T & T: How long have you been in the Food Industry and When and Why did you decide to start a food truck? FT: We are new to the food industry, but both Kris and I have been big home cooks for years. We decided to start the truck because we felt there was a lack of quality affordable food to choose from. I guess we kind of see ourselves as food activists. Its hard to believe we live in a world where a tomato from Mexico costs less than one from Lancaster. The other reason we started the truck is because we love being active in Philly. Especially at art events. The truck has been the best way to get involved and meet cool people everyday. Like yourself! 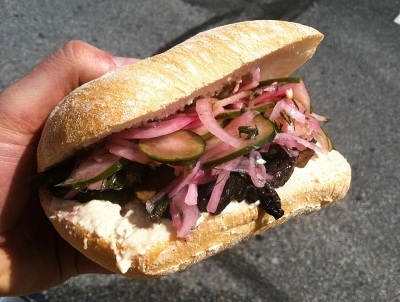 T & T: Best elevator pitch on what sets your Food Truck Cuisine apart from others. FT: Hand made, local, fresh, and always unique. Classic comfort foods with a gourmet twist. 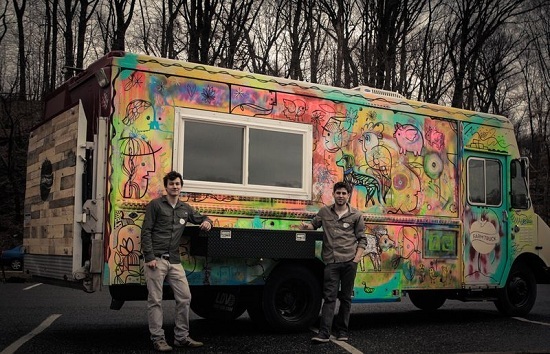 T & T: What do you wish the City would change about Food Truck Vending in Philadelphia? FT: The restricted streets list is about 20 pages long and center city is off limits. Its hard to work within the parameters. We need to be where people are. We are hoping to pair up with parking lot owners in the city to start creating Food Truck Lots to bring our gourmet product into Center City. T & T: Who's the most famous person to come up to your truck? And/Or At what events do you do the most business? FT: Brad Pitt, Tom Cruise, and Carrot Top. Just joking. For now we are perfectly happy serving hungry Philadelphians! Although Mayor Nutter nearly came to our truck today! He was 10 ft away. T & T: Each of you name one of your favorite movies And/Or something else you'd like Tinsel & Tine readers to know about you and your truck? FT: Our truck aesthetics are made from recycled lumber. The bumper is a joist from my basement and my house hasn't fallen down yet! The back lift is lined with reclaimed palettes. 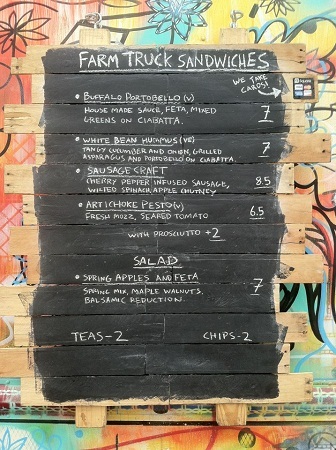 The Farm Truck is also a Tailgate Gallery displaying the work of local artists. If you want to know more about Eliot and Kris, they've recently been featured as alumni of their school Philadelphia University and on Grid Magazine. Be sure to like them on facebook and follow them on twitter to find out where the Farm Truck will be serving up goodness next!